REVIEW: WHEN I GROW UP I WANT TO BE…..IN THE U.S. NAVY! WHEN I GROW UP I WANT TO BE…IN THE U.S. NAVY! :NOAH TOURS AN AIRCRAFT CARRIER! Noah is excited for the chance to tour a real aircraft carrier with his Grandpa Ed, a proud Navy veteran. He is not excited that his little sister, Marina, is tagging along. Still, Noah tries to be patient. Readers chuckle and follow along as the siblings learn that each deck, each crewmember, and each piece of equipment adds another chapter to the history of the U.S. Navy and its mission to protect our country. Noah and Marina’s curiosity helps introduce readers to the complex and exciting work of an aircraft carrier and how each crewmember plays a vital role in its functioning. Wigu Publishing is a collaboration among talented and creative individuals working together to publish informative and fun books for our children. Our titles serve to introduce children to the people in their communities who serve others through their vocations. Wigu’s books are unique in that they help our children to visualize the abundant opportunities that exist for them to be successful and to make a difference. Our goal is to inspire the great leaders and thinkers of tomorrow. Wigu’s newly released children’s book series, When I Grow Up I Want To Be…, features vocations many children dream about – a firefighter, a teacher, a soldier, a doctor – all combining engaging elements of storytelling with real world facts and information. Both educational and fun, the fully illustrated book series takes its readers on a journey of discovery, exploring how one finds their career, learns the necessary skills, and how they excel and grow within their chosen field. WHEN I GROW UP I WANT TO BE…IN THE U.S. NAVY! : NOAH TOURS AN AIRCRAFT CARRIER! by Wigi Publishing is an interesting children’s book/educational/career/military. #4 in the “When I Grow Up I Want To Be…”, these are stand alone titles. I absolutely love this series! It is very educational, informative, and lots of fun, with wonderful illustrations. A learning experience for not only children but for adults as well. In This one, we learn exciting details about an aircraft carrier and each crew member’s vital role. I would highly recommend this title, to not only young readers, but to educators, school libraries, parents, teachers, and grand-parents. Anyone who enjoys learning more about the U.S. Military is sure to love this title. I look forward to the next installment. Coming soon from Wigu Publishing. An educational and fun read! Received for an honest review from the publisher. REVIEW: WHEN I GROW UP I WANT TO BE….A FIREFIGHTER! WILL’S AMAZING DAY! Will was excited to go on his class field trip, until he learned they would be touring the local firehouse. Now, he is dreading the trip. For as long as he can remember, Will has been afraid of fire and, worse than that, firefighters! Though he knows firefighters are heroes who do dangerous work, to him they are giants in heavy coats and masks. 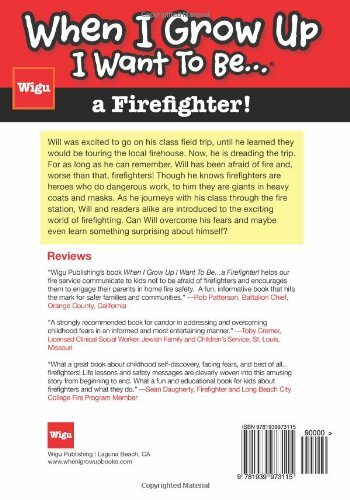 As he journeys with his class through the fire station, Will and readers alike are introduced to the exciting world of firefighting. Can Will overcome his fears and maybe even learn something surprising about himself? WHEN I GROW UP I WANT TO BE…A FIREFIGHTER! 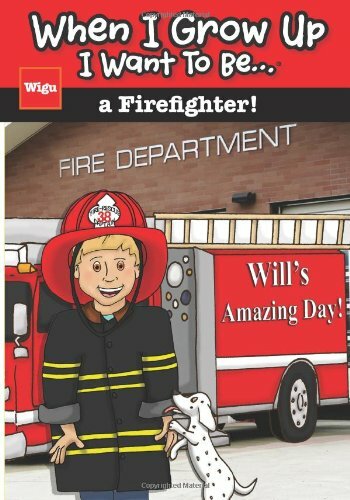 WILL’S AMAZING DAY by Wigu Publishing is an delightful Juvenile nonfiction/Educational/Vocational for children ages 6 and up. #4 in the “When I Grow Up I Want To Be” series, and what an awesome series. I absolutely love this series! This series is an excellent way for young readers to learn more on careers. It is very educational as well as entertaining. A FIREFIGHTER! WILL’S AMAZING DAY will help young readers, learn more about the Firefighters, it helps the fire service communicate with kids, so they are not afraid of firefighters. It encourages young children to talk with their parents about home fire safety. A fun, informative tale about families,communities and careers. I would highly recommend this series to anyone with young children, educators, parents, and grandparents alike. Well done, Wigu Publishing! Received for an honest review. 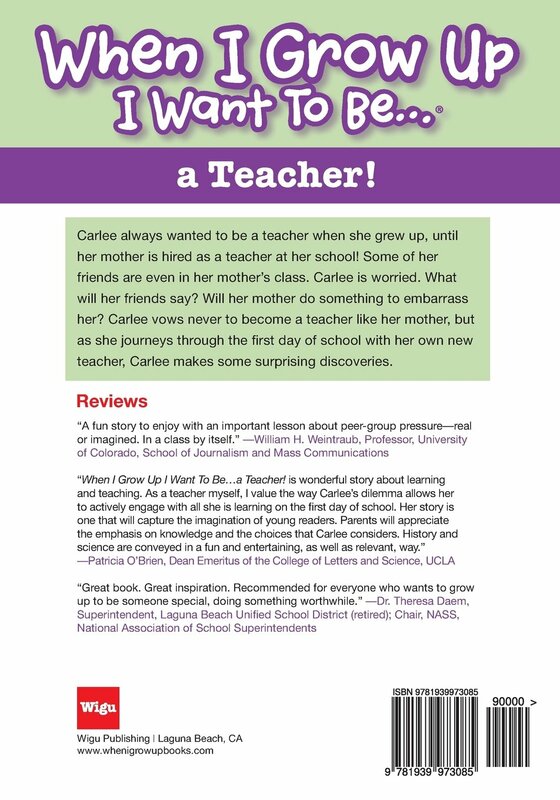 WHEN I GROW UP I WANT TO BE….A TEACHER! CARLEE LEARNS A SURPRISING LESSON! Carlee always wanted to be a teacher when she grew up, until her mother is hired as a teacher at her school! Some of her friends are even in her mother’s class. Carlee is worried. What will her friends say? Will her mother do something to embarrass her? Carlee vows never to become a teacher like her mother, but as she journeys through the first day of school with her own new teacher, Carlee makes some surprising discoveries. WHEN I GROW UP I WANT TO BE…..A TEACHER! : Carlee Learns a Surprising Lesson! by Wigu Publishing is a wonderful Children’s Book/Careers. #2 in the “When I Grow Up I Want To Be…..” series, and of course is a stand alone. See, “When I Grow Up I Want To Be…..in the U.S. Army! : Jake Learns a about the U.S. Army. I absolutely love this series for ages 6-up! What an exciting way for youngsters to learn about teachers, peer pressure, history, science and the the decision making. A fun, educational, informative yet entertaining tale, which is filled with creative illustrations. I would highly recommend this series, as well as this title to educators, parents, grand-parents, librarians, and young readers. Anyone who enjoys entertaining, informative, and exciting reads! A must read! Well done again! Received for an honest review from the publisher.